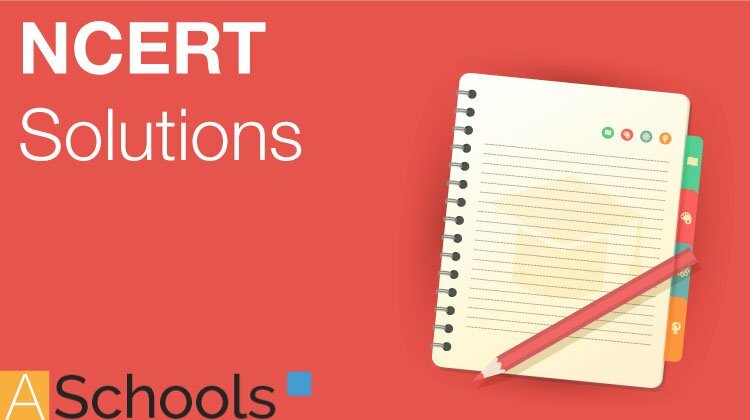 Here you can get Class 12 Important Questions Chemistry based on NCERT Text book for Class XII. Chemistry Class 12 Important Questions are very helpful to score high marks in board exams. Here we have covered Important Questions on Alcohols, Phenols and Ethers for Class 12 Chemistry subject. Monochlorination of toluene in sunlight followed by hydrolysis with aq. NaOH yields. How many alcohols with molecular formula C4H10O are chiral in nature? What is the correct order of reactivity of alcohols in the following reaction? CH3 CH3 OH2 can be converted into CH3CHO by ______________. The process of converting alkyl halides into alcohols involves_____________. Which of the following compounds is aromatic alcohol? Give IUPAC name of the compound given below. IUPAC name of m-cresol is ___________. Which of the following species can act as the strongest base? 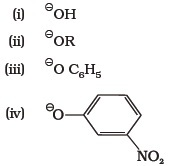 Which of the following compounds will react with sodium hydroxide solution in water? Phenol is less acidic than ______________. Mark the correct order of decreasing acid strength of the following compounds. Mark the correct increasing order of reactivity of the following compounds with HBr/HCl. Which of the following are used to convert RCHO into RCH2OH? Which of the following reactions will yield phenol? Which of the following reagents can be used to oxidise primary alcohols to aldehydes? Heat in the presence of Cu at 573K. Phenol can be distinguished from ethanol by the reactions with _________. Which of the following are benzylic alcohols? What is the structure and IUPAC name of glycerol? Write the IUPAC name of the following compounds. Write the IUPAC name of the compound given below. Name the factors responsible for the solubility of alcohols in water. Suggest a reagent for the following conversion. Out of 2-chloroethanol and ethanol which is more acidic and why? 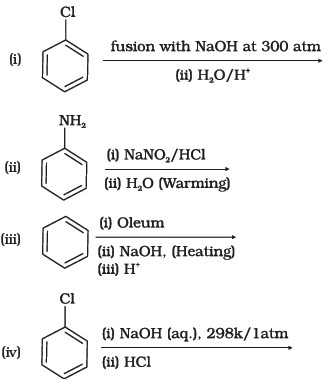 Suggest a reagent for conversion of ethanol to ethanal. Suggest a reagent for conversion of ethanol to ethanoic acid. Out of o-nitrophenol and p-nitrophenol, which is more volatile? Explain. Out of o-nitrophenol and o-cresol which is more acidic? When phenol is treated with bromine water, white precipitate is obtained. Give the structure and the name of the compound formed. Alcohols react with active metals e.g. Na, K etc. to give corresponding alkoxides. Write down the decreasing order of reactivity of sodium metal towards primary, secondary and tertiary alcohols. What happens when benzene diazonium chloride is heated with water? Name the enzymes and write the reactions involved in the preparation of ethanol from sucrose by fermentation. How can propan-2-one be converted into tert- butyl alcohol? Write the structures of the isomers of alcohols with molecular formula C4H10O. Which of these exhibits optical activity? 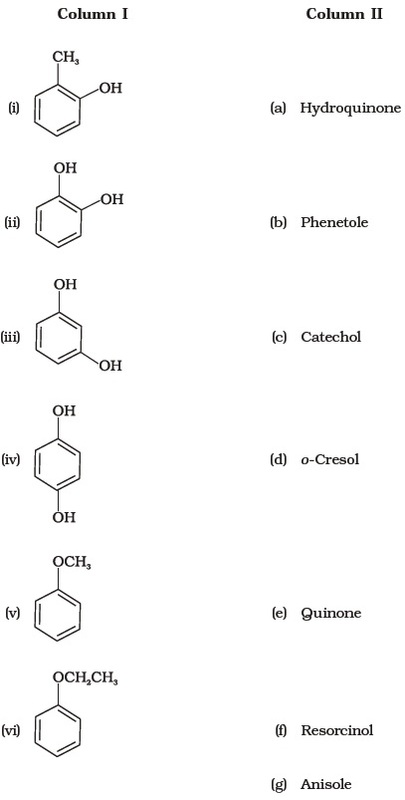 Explain why is OH group in phenols more strongly held as compared to OH group in alcohols. Explain why nucleophilic substitution reactions are not very common in phenols. Preparation of alcohols from alkenes involves the electrophilic attack on alkene carbon atom. Explain its mechanism. Explain why is O==C==O nonpolar while R—O—R is polar. Why is the reactivity of all the three classes of alcohols with conc. HCl and ZnCl2 (Lucas reagent) different? Write steps to carry out the conversion of phenol to aspirin. Nitration is an example of aromatic electrophilic substitution and its rate depends upon the group already present in the benzene ring. Out of benzene and phenol, which one is more easily nitrated and why? In Kolbe’s reaction, instead of phenol, phenoxide ion is treated with carbon dioxide. Why? Dipole moment of phenol is smaller than that of methanol. Why? Ethers can be prepared by Williamson synthesis in which an alkyl halide is reacted with sodium alkoxide. Di-tert-butyl ether can’t be prepared by this method. Explain. 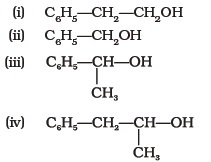 Why is the C—O—H bond angle in alcohols slightly less than the tetrahedral angle whereas the C—O—C bond angle in ether is slightly greater? Explain why low molecular mass alcohols are soluble in water. Explain why p-nitrophenol is more acidic than phenol. Explain why alcohols and ethers of comparable molecular mass have different boiling points? The carbon-oxygen bond in phenol is slightly stronger than that in methanol. Why? Arrange water, ethanol and phenol in increasing order of acidity and give reason for your answer. Match the structures of the compounds given in Column I with the name of the compounds given in Column II. Match the starting materials given in Column I with the products formed by these (Column II) in the reaction with HI. Match the items of column I with items of column II. (v) Both assertion and reason are correct statements but reason is not correct explanation of assertion. Reason : Addition of water in acidic medium proceeds through the formation of primary carbocation. Assertion : p-nitrophenol is more acidic than phenol. Reason : Nitro group helps in the stabilisation of the phenoxide ion by dispersal of negative charge due to resonance. Assertion : : Bond angle in ethers is slightly less than the tetrahedral angle. Reason : : There is a repulsion between the two bulky (—R) groups. Assertion : : Boiling points of alcohols and ethers are high. Reason : They can form intermolecular hydrogen-bonding. Assertion : Like bromination of benzene, bromination of phenol is also carried out in the presence of Lewis acid. Reason : Lewis acid polarises the bromine molecule. Assertion : o-Nitrophenol is less soluble in water than the m- and p-isomers. Reason : m- and p- Nitrophenols exist as associated molecules. Assertion : Ethanol is a weaker acid than phenol. Reason : Sodium ethoxide may be prepared by the reaction of ethanol with aqueous NaOH. Assertion :: Phenol forms 2, 4, 6 – tribromophenol on treatment with Br2 in carbon disulphide at 273K. Reason : Bromine polarises in carbon disulphide. Assertion : Phenols give o- and p-nitrophenol on nitration with conc. HNO3 and H2SO4mixture. 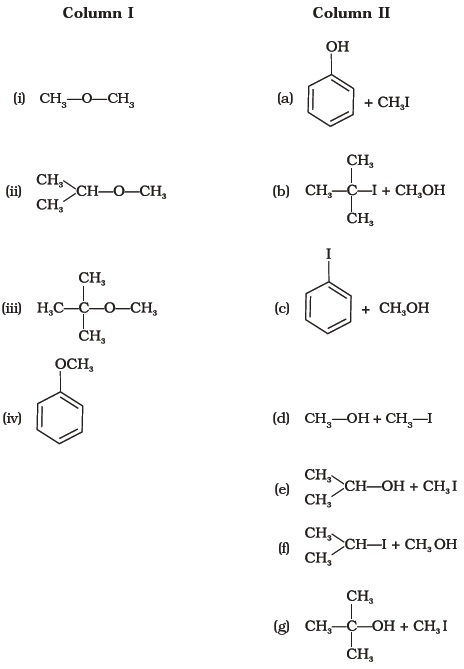 Reason : —OH group in phenol is o–, p– directing. Write the mechanism of the reaction of HI with methoxybenzene. (a) Name the starting material used in the industrial preparation of phenol. (b) Write complete reaction for the bromination of phenol in aqueous and non aqueous medium. (c) Explain why Lewis acid is not required in bromination of phenol? How can phenol be converted to aspirin? Explain a process in which a biocatalyst is used in industrial preparation of a compound known to you.